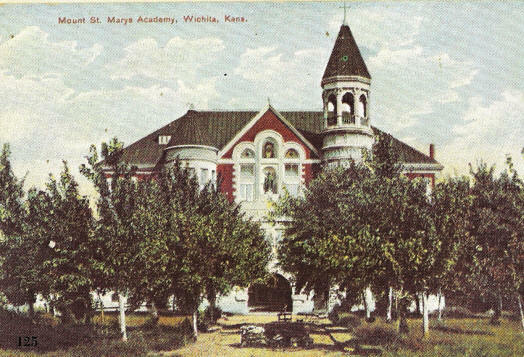 THEN: An old postcard view of Mount St. Mary’s Academy, 3700 E. Lincoln St.
NOW: Mount St. Mary’s Convent, rebuilt in 1914, after a fire destroyed the first structure, built by the Dutch Reformed Church as Wichita University in 1888..
Peerless Princes of the Plains, the postcard book published by Two Rivers Publishing Company in 1976, offers the best overall view of this issue’s Then and Now: A "Wichita University" which was NOT "the" Wichita University we know and love. Other sources for this article are the Wichita Beacon, Wichita Eagle and Tihen Notes. "Ninety years ago people were eager to buy home sites near a college, much as they now want to build their houses near a country club or a lake. Land speculators therefore joined with church groups to start five colleges in Wichita in the boom period of the mid-eighties. One such college was named ‘Wichita University of the Reformed Church of America,’ and its building was located on East Lincoln Street. The panic of 1888 ended ‘Wichita University,’ but later a group of Catholic sisters acquired the building for a convent which they called Mount St. Mary’s. This building burned in 1913, but the sisters rebuilt, and Mt. St. Mary’s convent is still located at 3700 East Lincoln." The Reformed Church built that first "Wichita University," on land donated by C.C. Fees, 1½ miles southeast of the city in an area that soon came to be known as College Hill. The brick building with stone trimmings was designed by architects Dumont and Hayward and constructed by B.W. Downing. It was three stories tall, 100 feet wide and 60 feet deep. Construction began in the spring of 1887, and the school opened Sept. 6, 1888, with 100 students enrolled. The biggest complication, both before and after the opening, was transportation. Residents from the area petitioned the city council to grade Clifton from Douglas to the Wichita University "so as to admit of a street railway." That petition was granted, but the Wichita Street Railway company was reluctant to build a street car line south of Douglas on Clifton, so the College Hill residents agreed on a line on Hillside instead. It was agreed that a stage line would carry students from the nearest point of the motor line for free until the line to the University from Hillside and Douglas was completed. It was also agreed that fare from any part of the city to the university would be three cents. For those providing their own transportation, sheds for horses were built. And perhaps aiming to draw students from beyond the city, the university built a "boarding hall," which opened in September 1892. The Eagle reported students as saying "the board was better than they received anywhere else. It included meat three times a day and a variety of dishes good enough for a king." By its second year of operation Wichita University not only provided academic training but sports as well. The Beacon reports a football game pitting the "Wichita university elevens" against Lewis Academy on the university campus, April 12, 1890 and that they took on the "Business college academy in Riverside park," Nov. 27, 1891 and won 16 to 0. The Eagle said the Wichita University team, whose colors were pink and white, would take on the high school team on the campus of Garfield University, Nov. 13, 1893. Garfield was another of the boom-time universities which also failed. It became Friends University. Wichita University started a new school year in September 1894, but the bust of 1890 had taken its financial toll. An October 1895 Beacon article said that the Synod of the Dutch Reform Church ordered "that trustees of the Wichita University turn over the buildings and grounds and all property to bondsmen, declaring it hopelessly involved." They considered opening it as an orphanage. Then they offered to sell the building, which cost $30,000 - $40,000, to the state for $15,000 - $16,000 for use as a state normal school. Finally, in December 1899, Bishop Hennessy purchased the land and building for $5,000 and turned it into a motherhouse for the sisters of St. Joseph. They assumed the debts of the university and set about extensive repairing and remodeling. Mount St. Mary’s was dedicated, June 23, 1900 and was used as a training school for novitiates as well as to house sisters brought from Parsons to staff the parochial schools of the diocese. However, 13 years later, on Sept. 7, 1913, a fire destroyed the Mount St. Mary’s. Bishop Hennessy then hired H.I. Ellis Construction Company to build a 136 by 146, four story brick and Silverdale stone building at a cost of $70,000. The new building, designed by A.A. Crowell, was dedicated Feb. 11, 1915. They built a $110,000 addition, designed by H.G. Overend, in September 1940, on both the north and south ends of the building. Finally, March 8, 1955, the city commission voted to condemn five houses and to route the extension of Lincoln from Hillside to Oliver in a roundabout route north to Morris so as not to divide the property owned by the Sisters of St. Joseph.